Question: Will some vegetables be limited? Answer: Yes. All small share produce options are limited except the unlimited pick your own. Large shares get more unlimited choices, including u-pick and already picked options. Sweet corn is usually limited to 1 doz. /small share, 2 doz. /large share per week if the crop is good, while potatoes are limited for small shares and unlimited for large shares as soon as we start harvesting them in large quantities. Other crops may be limited due to weather related problems occasionally, but we grow such a wide variety of vegetables that we should always have a good selection of most crops. By being a CSA member, you will get first choice of whatever we have. Question: I like to can, freeze, and dry. What will be available for this? Answer: Peas, string beans, and canning tomatoes will be available in large quantities for “PYO.” We have some great salsa, sauce and tomato soup recipes we’ll be glad to share! You can take all you pick yourself and preserve it for your family’s winter use. Sweet corn we always pick ourselves, but if you want additional to freeze or have a big party, you can buy extra if ordered ahead of time at a lower discount rate, for your own use (subject to availability). Many years the broccoli, cauliflower, spinach, squash, and peppers have been plentiful enough for large shares to freeze. Question: How else do people preserve their produce? Answer: Many people use dehydrators, or simply air dry produce and herbs. Most herbs can be used all winter long this way, if they are sufficiently dried. Tomatoes are also great dried. Just soften them in olive oil and top your focaccia bread or pizza with them! Some share members have seasoned sliced zucchini and dehydrated them to make zucchini “chips”. Pesto can be made from the basil and garlic to freeze in ice cube trays and stored in zip-loc bags for winter use. 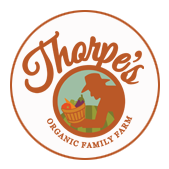 Question: How are the Thorpes going to limit what a family will take on the “unlimited” produce on large shares? Answer: We work hard to grow and harvest your produce. We want you to get all you need, but please take only what your family needs. We want you to take what you like, and enough of it for only 7 days, because you will be back to get fresh vegetables again every week. For example, last year we had a bountiful crop of potatoes. Our customers could take all they wanted for fresh use every week there was extra. It did not include storing bushels of them up for winter, but at the end of CSA everyone could buy all the potatoes they wanted at a discounted price or get potatoes all winter long by joining the winter share program. Occasionally there has been enough unlimited already picked peppers, broccoli, or spinach for winter freezing, or cabbage to make sauerkraut. Question: Why are some vegetables occasionally available for sale in the store, but not included in shares? Answer: Occasionally, at the beginning of a certain crops season, there isn't enough to go around to each share member, so we may offer it for sale in our farm store. As soon as the crop begins producing well, however, we will include it in all vegetable shares! Question: Why does some of my produce still have dirt on it? Answer: We harvest all of your produce fresh from the field, usually on the day you pick it up. This means that some items will not be meticulously washed before pick-up. The good news is, this means that some of the produce will last longer for you, and you also get a better value for your money. If we spent more time washing all of the vegetables in the shares, that would increase the cost of CSA shares, and we do our best to keep them as economical as possible. We recommend investing in a salad spinner, they are indispensable for washing greens! Question: Why is some of my produce "ugly"? Answer: Some of the produce you receive in your shares might look "ugly" from the outside, but that in no way means it won't be delicious or nutritious! Fruits and vegetables don't always grow picture perfect, like the shiny waxed produce you find in grocery stores. A lot of produce is wasted all over the world because large grocery retailers have trained consumers to only buy produce that looks perfect, but that means we waste so much good food! Don't be alarmed by crooked carrots, funny looking potatoes, or misshapen summer squash, that's just how things grow sometimes. Question: What happens to leftover produce from the farm after CSA pickups? Answer: Nothing goes to waste on the farm! We donate some leftover produce to local food banks, and whatever else is leftover is fed to our organically raised pigs and chickens. The farm also has many compost piles, which we eventually use during our various plantings to boost our soil health, which in turn provides more nutritious produce for you! Question: Will all of the vegetable produce be bagged for customers? Answer: Not always. We will pick it and make it available in bulk. We request that you bring your own boxes and/or bags to transport your produce with. You may also want to bring a cooler with an ice pack to keep your greens or lettuce crisp in hot weather. Question: Will quantities be limited on fruit shares? Answer: Yes. We will be generous, but will only give you some of each seasonally available berry or fruit. Strawberries and raspberries are very perishable and are best used within 1 or 2 days, and kept cool. Blueberries keep very well, as will some of the tree fruits. For detailed amounts received in previous years, click here. Question: Who are you certified organic through? Answer: This is our 18th year of being certified organic. We are certified through “NOFA NY”. There is a lot of paperwork involved, plus inspections, but being certified is very important to us. The National Organic Policy made the rules the same nationwide. They are good rules and we are very pleased to be organic farmers on every acre we farm, including our vegetables, berries, grains, hay, pasture and woods. Our livestock are fed only our own organic feed that we grow, bedded on our own organic straw, and allowed daily unlimited access to the outdoors. Question: What if I am out of town or can’t get my share? Answer: You can let a friend or relative have your share. Just tell them what day and time to pick it up and to let us know they are getting your share. If no one is coming, please let us know so we will not waste any produce. Question: When will I pick up my produce? Answer: You may choose either Tuesday or Thursday for your pick-up day. Just let us know which day you prefer, and we can plan for you that day all season. Pick up time starts at 3:30 PM and goes until 6:30 PM so we can pick your produce fresh for you that day. Please do not come until after 3:30 because we are trying desperately to get things picked right up until 3:30 to ensure that everything is fresh for you. We need every last minute of the day to get ready! The driveway at the farm can get very full and busy, so if you'd rather avoid the traffic, picking up your share after 4:30 usually ensures a quieter atmosphere, which is especially helpful if you bring your children. If you can't make it within the pickup time frame, we can box your share and set it aside to be picked up later in the day or the following day, for a fee of $5.00. Please call or e-mail us to request that we box up your share for you. Question: Where will I pick up my produce? Answer: produce pickups are held at our farm which is located at 12866 Route 78, East Aurora, NY 14052. There is a large sign out front with our farm name on it. Please be careful when pulling in and out of the driveway as it's at the top of a busy hill where traffic moves very quickly. Vegetable shares will pickup their produce at the green and white striped produce tent that is visible as soon as you pull in the driveway, and fruit shares will pickup their fruit at the wooden open-air roadside stand. At each pickup, you'll check in with whomever is under the vegetable tent or in the fruit stand, and they'll direct you from there! Question: Why are there occasional bugs on my produce? Answer: You will find the occasional bug or insect on your produce, because we farm organically! This means we don't apply any insect-killing pesticides to your produce. Bugs are a natural part of the eco-system, and while some of them are pests, many are actually beneficial! So don't worry about any errant bugs, just brush or wash them off and rest assured know your produce hasn't been poisoned with a chemical designed to kill.